Hey all! It’s the weekend, which means it’s time to enjoy some Fairburn Flapjacks (your pancakes from the nutrition plan) and maybe a mimosa or two. To celebrate mornings in and days off, we are sharing a new breakfast recipe that we have been loving lately. We tend to go through phases where we eat the same thing for breakfast for a month, then get sick of it and move on to a new breakfast! This actually kind of happened with this recipe. We use to eat a version of this meal all of the time. The difference was that we made it with eggs (I know, I know, we were not always plant-based guys..). However, we are bringing back this recipe but with a new twist! Our eggs over avocado toast is now the Haleiwa Scramble over Avocado Toast! Why Haleiwa? Well for one, we love all things Hawaiian, and two, a local restaurant nearby sells a similar item that is called the Heiwa scramble, but we always mispronounce it and say Haleiwa. So why not. In a medium sized skillet, heat a little vegetable broth (approx. 3 to 4 tbsp, but can add more if needed). The veggie broth simply takes the place of heating oil to sauté and cook things. Break up the tofu into the pan and mix in all remaining ingredients. Use a potato masher to break up the tofu further to look like scrambled eggs. Cook for 5 to 10 minutes, or until the liquid has absorbed, everything is mixed in well, and everything is hot and ready! Meanwhile, toast two slices of bread. Once done, spread half of an avocado across the two slices of toast. 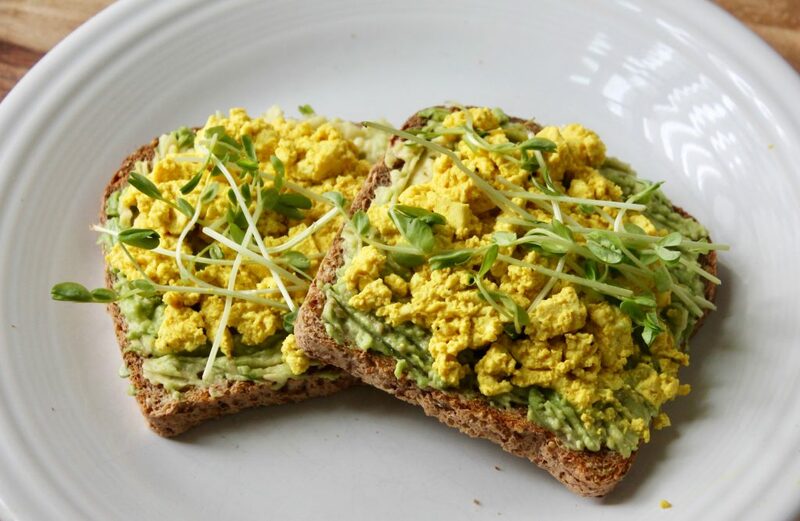 Then spoon a little of the tofu scramble mixture over both slices of toast. Top with some chopped spinach or other greens, and enjoy!